Step 1: Bring 1 gallon of water with 1 tablespoon of salt to a boil in a large stockpot. Step 2: Cut the thorny tips off the ends of the artichoke leaves with kitchen scissors (optional). Trim 1/8 inch off the stem end. (The rest of the stem is edible.) Using a chef’s knife, cut each artichoke in half lengthwise. Using a melon baller or grapefruit spoon, scrape out and discard the “choke” (the clump of fuzzy fibers just above the heart). Step 3: Zest the lemon—you’ll need 1 teaspoon for the aioli. Set the zest aside. Cut the lemon in half and discard the seeds. Rub the cut parts of the artichoke with one of the lemon halves to keep them from browning. Step 4: Place the artichokes in the boiling water and cook until just tender, about 20 minutes. Use a metal skewer to test for doneness: it should pierce the artichoke with just a little resistance. Do not overcook: the artichokes should remain firm. Drain the artichokes in a colander, running cold water over them until they are cold. Position the artichokes upside down and drain them well on a wire rack covered with a dish towel or paper towels. The artichokes can be cooked ahead to this stage and refrigerated for up to 24 hours. Step 5: Stir the chives into the melted butter or olive oil in a small bowl. Step 6: Set up your grill for direct grilling and preheat to high. If using a charcoal grill, place hardwood chunks or chips on the coals. If using a gas grill, lay a few wood chunks between the heat diffuser bars or on the ceramic heating elements. If using a wood grill, do nothing more than light it: don’t let the flames die down completely—it’s good to have some smoke and fire. Brush or scrape the grill grate clean and oil it well. Step 7: Brush the cut sides of the artichokes with chive butter and dab more butter between and over the leaves. Season with salt and pepper. Arrange the artichoke halves on the grill running diagonal to the bars of the grate. Grill for 2 minutes, then give each artichoke a quarter turn to lay on a crosshatch of grill marks. Baste the tops of the artichokes with the chive butter, dabbing it under the leaves. While you’re at it, grill the lemon halves for the aioli. Step 8: When the bottoms are browned and grill-marked, turn the artichokes over and grill the leaf side, again basting with chive butter. The artichokes are ready when sizzling hot and browned on both sides. 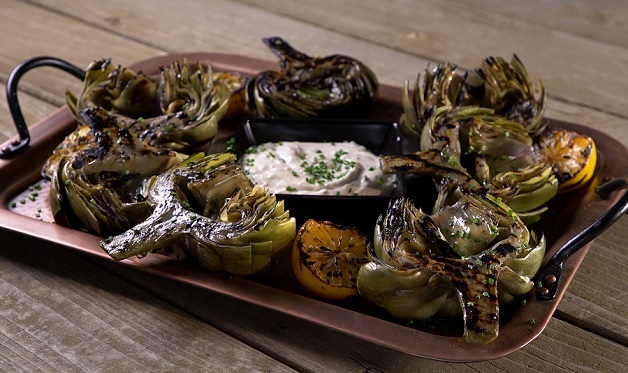 Transfer the artichokes to a platter or plates and serve with Charred Lemon Aioli for dipping.